People have been giving gifts to celebrate various anniversaries for centuries. The earliest recorded instances of giving gifts at wedding anniversaries come from Central Europe, and there is a tradition of using a different material to celebrate each milestone in a couple's life e.g a gift with a wooden theme after 5 years of marriage, and an increasingly expensive material used as the years go by. In Germany in the mid ages it was customary for a wife to receive silver garlands after 25 years and in gold after 50 years which gave rise to the "silver wedding" and "golden wedding" tradition. It was probably after Queen Victoria celebrated her sixtieth year on the throne, called the 'Diamond Jubilee' that diamonds came to be associated with 60 years. They are also associated with 75 years. 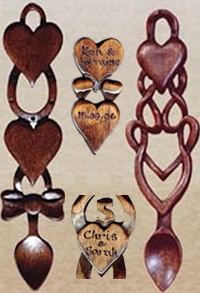 The earliest reference of giving wood after 5 years come in the late 19th century, but in Wales Wooden Love Spoons have been given to celebrate all anniversaries, especially among the general population. Of course the giver does not have to adhere strictly to the materials traditionally associated with the different stages, and there are many interesting ways of giving a gift which suggests the number of years a couple have been married other than a gift in the actual material associated with the number of years. There are traditional and modern materials related to each wedding anniversary - you can see the full lists below. 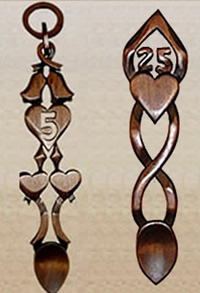 Some of our Welsh Love Spoons have the number of years the couple have been married carved into the design, but we can make all of the Lovespoons appropriate for any particular anniversay by engraving the number of years or the wedding date on to them at no extra charge! Wood is just right for the 5th Anniversary, but one can also adapt any gift for other anniversaries. For example, by wrapping it in paper, any gift would be perfect on a first anniversary, in cotton cloth for the second, in copper colored paper for the seventh or accompanied by flowers for the fourth or candy for the sixth and so on. Have fun looking at the lists and finding an unique way of presenting a truly unique anniversary gift.